Parents Day (the fourth Sunday in July) is to celebrate the love between a parent and child. Robert Munch’s book Love You Forever, will bring a tear to your eyes if you are a parent. Your parents have tried their hardest to raise you and have sacrificed for you over the years, so today is a fantastic day to honor your parents. You love your parents all days of the year, but remember to remind them of this love on thus special day. Remember to send a loving card to your parents. Whether it is mushy or funny a note they will appreciated the effort and it will let your parents know that you love them. Or dazzle them with these amazing photo cards. 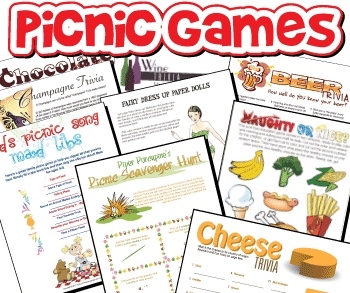 Play some fun Printable Picnic Games! Parent of the Year Award Go to your local hardware store and buy a wooden plaque. Carve "Parent of the Years Award" and your parent’s name. When you get home, lightly sand the plaque and the put on a couple of coats of polyurethane. Write about a special event that happened between you and your parents e.g., a family vacation, etc. Dedicate the book to your Parents. Write a love felt or humorous poem to your parents. Share Your Parents Day Ideas Here! !